Feb. 2, 2009, 7:56 a.m.
By Martin Langeveld @MartinLangeveld Feb. 2, 2009, 7:56 a.m. Surprisingly, there have been no blogospherical reactions (nor any big ripples elsewhere) to the Postmaster General’s ruminations last week before Congress, in which he hinted that perhaps mail delivery would need to be curtailed to five days a week. His thought is not to drop Saturday, but to eliminate a lighter day, like Tuesday, in order to help the Postal Service deal with a growing annual deficit that’s projected to hit $6 billion in the current fiscal year. The travails of the post office are being blamed in part on reductions in the volume of periodicals (newspapers and magazines) being mailed. Of more relevance here, any cut in postal frequency would have an impact on newspapers that are mailed, especially those that enjoy day-of-publication delivery. This includes many weeklies that rely almost exclusively on postal distribution. Among dailies, few rely heavily on the mail, but nearly all morning papers have some same-day postal delivery arrangements to reach customers in areas their own carriers don’t (or won’t) travel to. The Wall Street Journal once mailed most of their subscriber copies. It now has alternate arrangements (many via local newspaper carriers) in most areas, but still mails some copies. And of course the Christian Science Monitor is mostly mailed, but is going digital-only soon. First of all, the plan’s chances of getting a Congressional OK to cut delivery frequency may be slim to none (although if a forum at SiLive.com is any indication, customers wouldn’t have a big problem with it: “Good, bills will come 5 days a week instead of six”). And there may actually be a better mesh between a reinvented post office and a reinvented news business. I’ve been suggesting at every opportunity an online-first, weekend-print-only news enterprise. I’m convinced that demographic and economic forces will push newspapers in that direction, sooner rather than later. The post office should be asking: how often does physical mail (they don’t call it snail mail) really need to hit mailboxes? Now that widespread Internet access is usurping most of the functionality of first class mail (the volume of which is plummeting along a curve similar to that of newspaper revenue) why not cut the delivery schedule in half again, to three times a week, or even twice a week — would anyone care? Or even, horror of horrors, deliver mail just once a week — but with a continuation of Priority Mail, parcel delivery and other profitable premium services on a daily basis. In other words, match each service and its price to the needs of customers, rather than offering nearly all services at the same daily level. Businesses or individuals with some critical dependence on more frequent delivery of mail could pay a premium for that service (just as the post office already offers Sunday or holiday delivery of Express Mail at a $12.50 premium). Now, I can already hear the uproar emanating from the offices of the National Newspaper Association, which represents community newspapers heavily dependent on postal delivery and which lobbies hard to protect newspapers’ postal interests. But as they know, the post office doesn’t reinvent itself overnight; in fact, its usual pace of change is glacial, if not geologic. Postal reinvention should be an open, public process (As Jarvis Would Say). Community newspapers would have time to adapt. In fact, this could be an opportunity for newspapers, which own a huge single-purpose delivery network themselves, to find ways to actually increase their delivery business by contracting to deliver all manner of periodicals, not just their own. They might also regain some of the money they’ve yielded over the years to direct marketing, a. k. a. junk mail, which today gets a bigger slice of total ad dollars than newspapers do. Ultimately, they could spin off that delivery arm, along with their printing divisions, retaining just the fully digital news business they should be focused on. As a footnote, I notice that the Detroit newspapers plan to offer postal delivery as an option on the days they’re eliminating their own deliveries. Given that the Detroit plans are ill conceived to begin with, I would not suggest regarding that as something for other papers to emulate. POSTED Feb. 2, 2009, 7:56 a.m.
Langeveld, Martin. "Could shrinking the post office help newspapers?." Nieman Journalism Lab. Nieman Foundation for Journalism at Harvard, 2 Feb. 2009. Web. 25 Apr. 2019. Langeveld, Martin. "Could shrinking the post office help newspapers?." Nieman Journalism Lab. Last modified February 2, 2009. Accessed April 25, 2019. https://www.niemanlab.org/2009/02/could-shrinking-the-post-office-help-newspapers/. 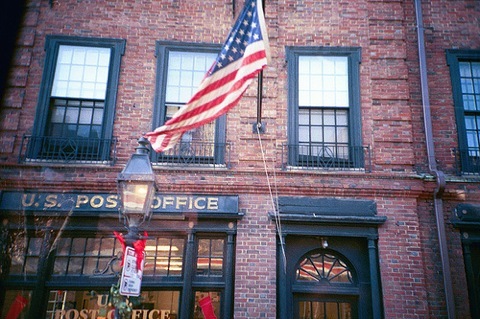 | title = Could shrinking the post office help newspapers?